Spring is traditionally the season for new beginnings, so it's only apt that Eileen Fisher—both the designer and the brand—is tweaking its comfort-driven, trend-adverse lineup in time for clearer skies and fairer weather. The forecast? A broader commitment to both environmental and social issues. 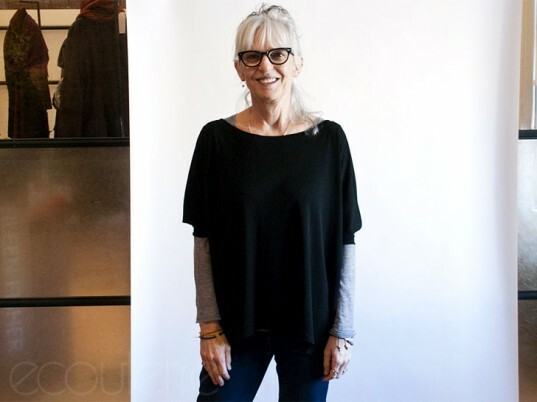 A lifestyle champion at its core, Eileen Fisher is fueled by a desire to "empower the well-being" of not just its producers and customers, but also that of the community at large. 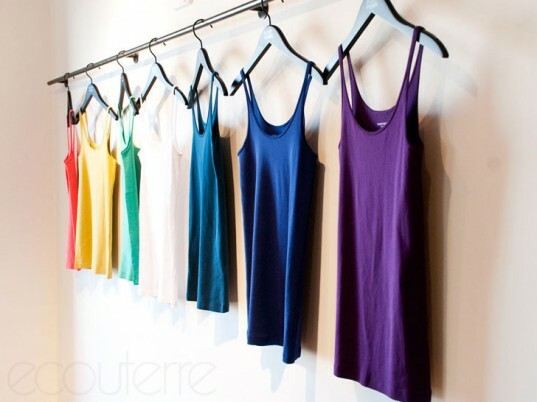 Ecouterre dropped by the Eileen Fisher Creative Center in Manhattan on Tuesday for a tête-à-tête with Fisher and her team, who have helped the brand transcend the sum of its products. To craft its spring collection, Eileen Fisher worked closely with Bluesign, one of the world’s most stringent textile standards for environmental protection and safety, to envelop the label’s signature clean lines in lightweight and low-impact silk, color-grown organic cotton, hemp, and alpaca. The Bluesign standard guarantees that the resulting textile is produced as cleanly and efficiently as possible. Bluesign isn’t an easy standard to meet. It’s not limited to the mitigation of toxic by-products, for one. Rather, it analyzes all input streams (raw materials, chemical components) along the entire supply chain using a battery of tools. By eliminating harmful substances even before production begins, the Bluesign standard guarantees that the resulting textile is produced as cleanly and efficiently as possible. Convincing one of its Chinese dye houses, which produces its silk, to make the Bluesign-required changes wasnt easy, but it paid off in a big way. Right now, 10 percent of Eileen Fisher is Bluesign-certified. Businesses for Innovative Climate and Energy Policy and the American Sustainable Business Council. Its partnership with cooperatives in Peru has supplied a bounty of cashmere-soft knitwear while promoting economic development in the region. Education, social empowerment, and outreach are similar touchstones of Eileen Fisher’s philosophy. Its five-year partnership with cooperatives in Arequipa in Peru has supplied a bounty of cashmere-soft (yet surprisingly low-maintenance) knitwear while building schools, sustaining livelihoods, and promoting economic development in the region. Considering that most of a garment’s ecological impact occurs after it leaves the store, however, Eileen Fisher’s efforts would be for naught if it didn’t factor its customer into the equation. “Instead of thinking about clothing, it’s thinking about women’s relationship to clothing,” Shoana Quinn, the company’s sustainability leader, tells Ecouterre. In addition to sourcing fabrics that can be washed by hand and hung to dry without sacrificing quality, the label also offers laundering tips, along with other ways you can make a difference, on its website and at its stores. 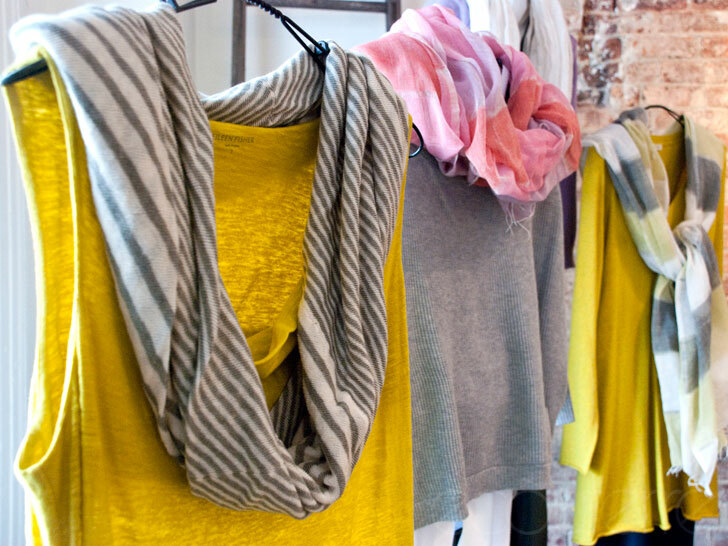 Green Eileen is a new initiative that offers gently worn Eileen Fisher garments for resale. Moving beyond the personal, the company recognizes the need to challenge existing retail models. 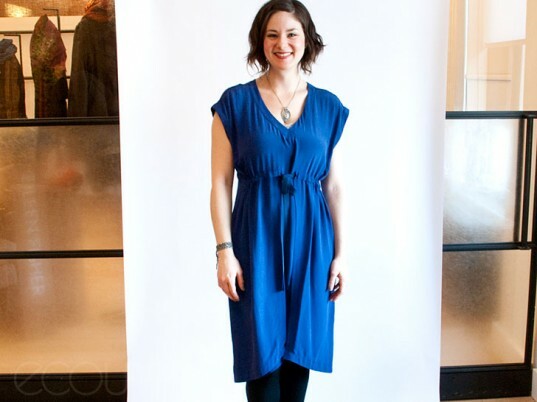 One such effort is Green Eileen, a new initiative that offers gently worn Eileen Fisher garments for resale. The first Green Eileen store, which opened in Yonkers, NY, in December, accepts donations, but New Yorkers who don’t want to schlep upstate can also drop off their unwanted garments at the Eileen Fisher store on Fifth Ave. Bonus: For every piece you donate, you receive a $5 voucher for a new Eileen Fisher purchase. Over in Irvington, the Eileen Fisher Lab Store is testing a hybrid model that retails both new samples and secondhand clothes. If successful, expect to see one or both of these schemes pop up in more locations nationwide. To craft its spring collection, Eileen Fisher worked closely with Bluesign, one of the world’s most stringent textile standards for environmental protection and safety, to envelop the label's signature clean lines in lightweight and low-impact silk, color-grown organic cotton, hemp, and alpaca. Bluesign isn't an easy standard to meet. It's not limited to the mitigation of toxic by-products, for one. Rather, it analyzes all input streams (raw materials, chemical components) along the entire supply chain using a battery of tools. By eliminating harmful substances even before production begins, the Bluesign standard guarantees that the resulting textile is produced as cleanly and efficiently as possible. The business has also endeavored to offset its own energy use by investing in two windmills in Iowa through Support Native Energy. Steered by a belief that policy isn't the only way to fight climate change, its advocacy work likewise extends to partnering with Businesses for Innovative Climate and Energy Policy and the American Sustainable Business Council. Education, social empowerment, and outreach are similar touchstones of Eileen Fisher's philosophy. Its five-year partnership with cooperatives in Arequipa in Peru has supplied a bounty of cashmere-soft (yet surprisingly low-maintenance) knitwear while building schools, sustaining livelihoods, and promoting economic development in the region. Considering that most of a garment's ecological impact occurs after it leaves the store, however, Eileen Fisher's efforts would be for naught if it didn't factor its customer into the equation. The first Green Eileen store, which opened in Yonkers, NY, in December, accepts donations, but New Yorkers who don't want to schlep upstate can also drop off their unwanted garments at the Eileen Fisher store on Fifth Ave. Bonus: For every piece you donate, you receive a $5 voucher for a new Eileen Fisher purchase. "Instead of thinking about clothing, it's thinking about women's relationship to clothing," Shoana Quinn, the company's sustainability leader, tells Ecouterre.